Great Opportunity To Complete Your Dream Home! Blank Canvas Space. 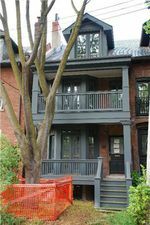 The Hard Work Is Done- Permits, 3 Storey Addition With Extended And Dug Out 9 Ft Basement, New Electrical, New Copper Plumbing With Cast Iron Stack, Framing Ready For Drywall, New Weeping Tile, Bsmt Flr Heating, New "Custom Divided' Windows, Exterior Cement Work & 3 New Balconies & Front Porch, Repointed Brickwork & Chimney, Front Slate Roof.2 Car Park W.Permit To Build Garage.